Using your smartphone or tablet you can inspect your equipment, assets and machines in real-time when you use one of three Trimble® Inspection solutions offerings. Trimble Inspection Solutions take the guesswork out of asset maintenance and put your equipment manager in control for increased equipment uptime and decreased costs. These Inspection Solutions allow you to visually inspect assets as well as store that data. Reports can be created quickly and easily. The easy-to-use Trimble Inspection Solutions software eliminates paperwork and human error by giving contractors more visibility into machine conditions for safety and preventative maintenance reasons. Minimal training is required so you can be up and running quickly. You can also use the current, documented information on health and safety for auditing purposes and preventative maintenance scheduling. If you are use Trimble Inspection Solutions software without a cell or Wi-Fi connection, the inspection results will be uploaded once connectivity is re-established or enabled. 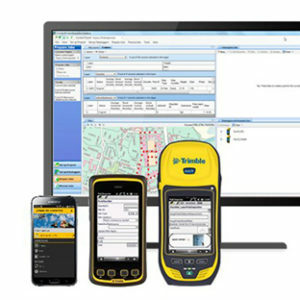 Reduce costs when you bring your own device into the Trimble Connected Site® and use one system for a complete, holistic picture of your fleet’s visual health. Trimble Inspection Solutions allow you to wirelessly aggregate and share asset condition across multiple sites. And with the inspection data for all assets stored centrally on a web-based database, you can create accurate reports and documentation when needed. Trimble Inspector is a free mobile app that can run on both Android and iOS smartphones and tablets. It can be used for daily, weekly and monthly visual inspections and includes existing libraries of equipment, machine and vehicle types, makes and models and inspection checklists, making it easy to get started. After using Trimble Inspector for visual inspection, email reports back to the office for health and safety standards compliance. With Trimble Inspector you can keep track of current visual health status, hours, odometer readings and overall general condition. Another inspection solution offering is Trimble Inspector Pro. This solution offers the same functionalities of Trimble Inspector but adds in the ability to customize inspection reports to meet corporate health and safety requirements. It can also be used to create comprehensive maintenance reports for service crews. This added functionality is available with a subscription to Trimble Asset Manager office software. Trimble’s Asset manager software is a web-based, subscription solution that can be used to integrate, store and report asset condition data collected in the field by Trimble Inspector Pro. With a simple glance, you can see the condition of your entire fleet. Information collected is kept in a secure, central database so managers can access the data they need, when they need it. Data can be filtered for quick, easy analysis on a site-by-site basis. Trimble Asset Manager can provide you with a complete view of all your assets over multiple sites as well as assets inspected by multiple staff. When used with Connected Community’s Single Sign On, you can access a variety of applications, including Wireless Data Sync and Internet Base Station Service (IBSS) for simplified operations.